Head of the European Union Delegation to Ukraine, Ambassador Jan Tombiński, together with French and Croatian Ambassadors, Alain Remy and Tomislav Vidošević, officially inaugurated the European Cultural Week in Kyiv on May 14. Together, they opened the photo exhibition, “Homo Urbanus Europeanus,” by French photographer Jean-Marc Caracci at the Khanenko Art Museum in the Ukrainian capital. “Besides popularising the cultures and traditions of the EU member states in Ukraine, European Cultural Week is also a way to stress the cultural unity of European countries that goes beyond political borders,” Ambassador Tombiński said at the opening ceremony. “This year the EU will enlarge, opening its doors to Croatia, which is set to become the 28th member state of the European Union on 1 July 2013. 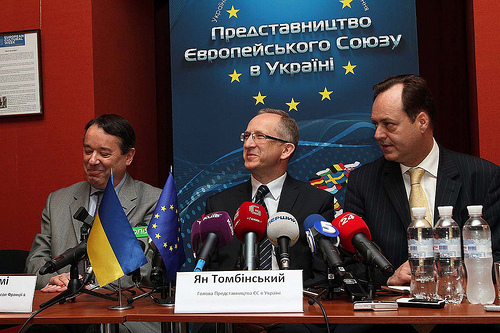 Ukraine is also a part of Europe’s cultural space and we hope it will come closer to the EU this year,” he added. 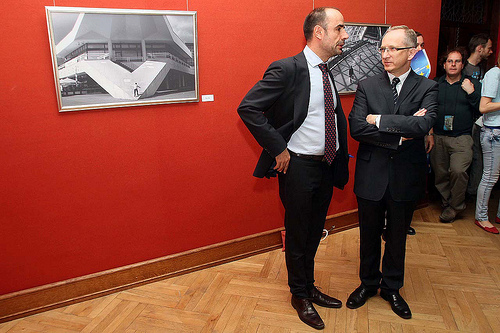 Tomislav Vidošević, the Croatian ambassador, agreed with the photographer: “All the European cities represented in the photo exhibition share a common spirit that the photographer was trying to emphasise,” he said. The diplomat also stressed that Croatia, as a new EU member state, will assist its immediate neighbours on their way toward joining the EU, and will support Ukraine’s European aspirations. The photo series, “Homo Urbanus Europeanus,” is the fruit of French photographer, Jean-Marc Caracci’s three years of travel across Europe. Its major goal is to capture Europeans in their cities, in order to represent what Caracci calls a European “Urban Being.” The project consists of 31 series, representing 31 European capitals, all photographed in the same style: sober and without any cultural or social visibility, favouring the similarity and “europeanity” of human experience in different European cities. The “Homo Urbanus Europeanus” project is an artistic tool for uniting European countries, whether they belong to the European Union or not.